2. Stay away from crackers, breads, candied fruit items, pies (unless you bring your own low carb pie or ice cream dessert or they provide one for you. 3. Drink, drink, drink– water and diet drinks a lot. Stay away from cider and sugary things to drink. 5. Grab the smallest plate and fill that, rather than filling a large plate with food. No refills, except for salad. 6. Eat meat and veggies, limit fruits. 7. Don’t sit close to the food buffet–avoid temptation. 8. Don’t eat the appetizers and wait for the meal. Most appetizers are calorie/carb laden. BE STRONG and know that you are doing something that will make you happier the next day. 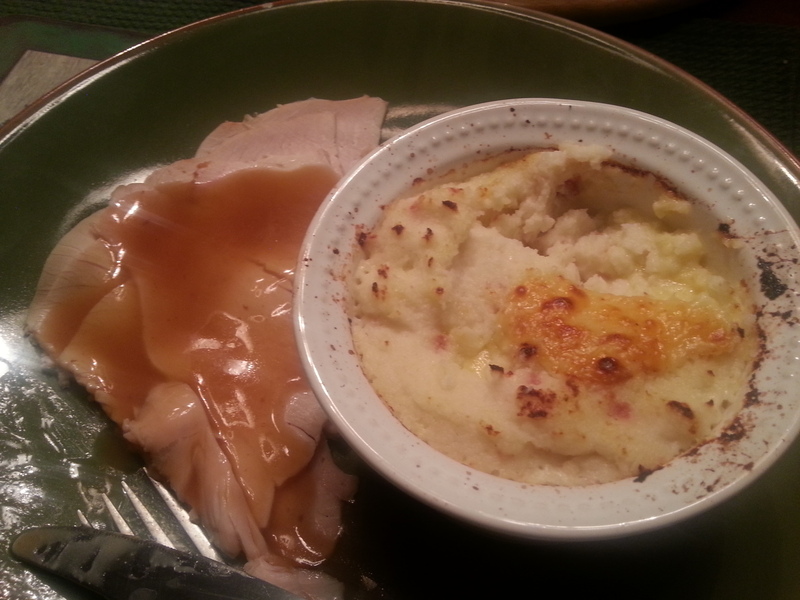 The last two years, for Thanksgiving, I had a salad, fresh turkey breast, gravy, veggies and a low carb ice cream and I was not only full and happy, but I didn’t gain weight the next day and it was delish. Can you say the same thing? This year to spice it up, I am going to try to make twice baked cauliflower and cheese and maybe a low carb pie, not sure yet. But one thing is for sure, I will be happy on the scale the next day and I didn’t put off my weight loss or maintenance for some lame holiday pig out excuse. You try it too! 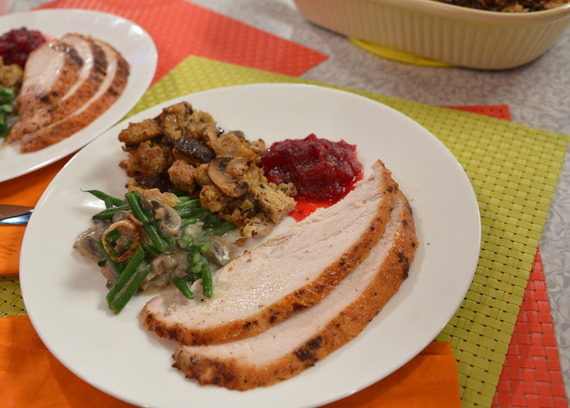 Thanksgiving Food and Delicious Substitutions to Keep You SKinny. I have eaten food substitutions on holidays for two years now and I have not gained a pound because I do it. I am going to tell you how to do it here. 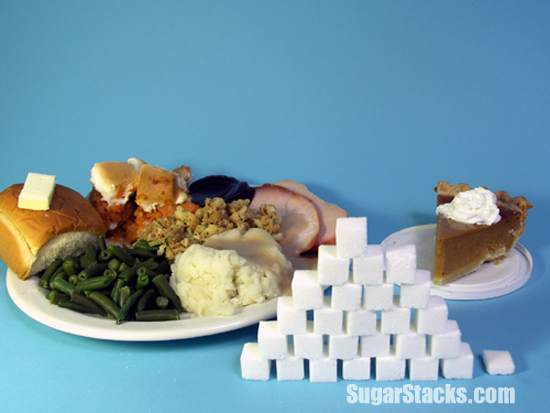 According to Sugarstacks.com, there are a lot of sugar cubes in one traditional Thanksgiving dinner. 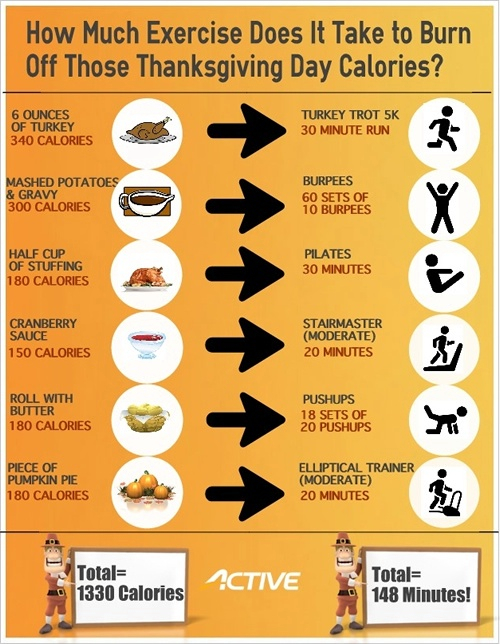 Do you really want to derail your diet or gain 5 pounds from one dinner, where you are eating things that are not necessarily absolute for a good Thanksgiving meal? Did the Puritans really want you to eat these things? Of course not! Here is a picture of a traditional meal. This is the equivalent of almost 26 sugar cubes. GRAVY: A tablespoon or two of gravy won’t kill you. LOW CARB BREAD STUFFING: You could make stuffing with low carb bread like JulianBakery.com or even Sara Lee 45 Calorie Bread (and eat a small portion) or skip stuffing. Do you really need it? FRUIT: Candied Cranberries are a bad idea. Skip it. Have sugar free jello instead or some delicious fresh fruit cut up and placed out in a bowl. One serving could be about 11g of carbs. DINNER ROLL: Not a great idea. Skip this or have a slice of low-carb bread like mentioned above. PIE: VERY LARGE AMOUNT OF CARBS unless you do a low carb pie. Get a dessert that is low cal like low-carb ice cream (Breyers has a delicious Smart Carb Vanilla) or get a recipe for low carb pie and make that (see below for four links to low carb pie recipes). Greek yogurt with fresh strawberries in it is also very good. –ALSO, I make a really nice salad with cheese in it and serve that instead of Sweet Potato Casserole. Cook cauliflower until tender [I use frozen and the microwave with NO water added for 10 minutes on high]. Preheat oven to 400F. Chop fine with pastry blender, potato masher or knife. Add all ingredients together in a medium bowl, fold until mixed. 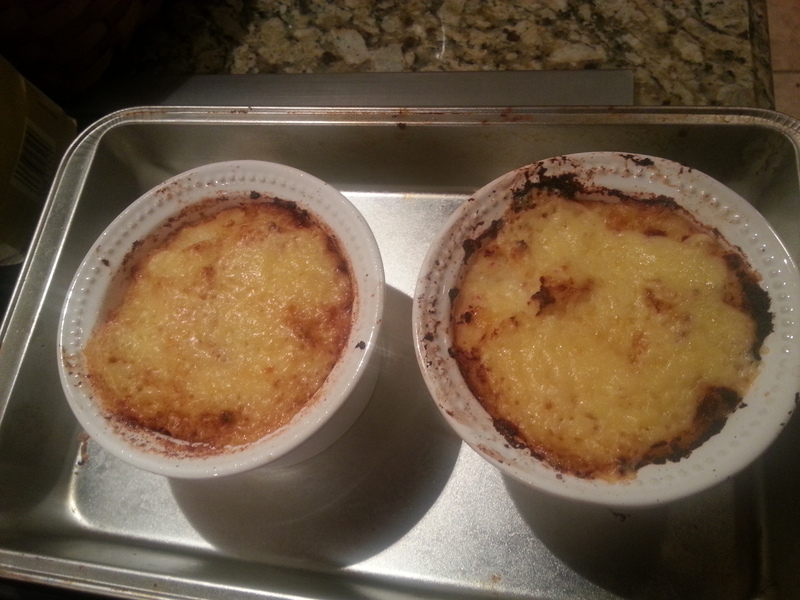 Use cooking spray on 4 seven ounce ramekins or other small oven safe dishes and spoon mixture into dishes. Place all small dishes on a cookie sheet for easier handling. Bake for 15 minutes on middle rack and then broil for a few minutes until top is golden brown. Makes 4 servings, but you may want to make extra, cuz…OMG this is good. 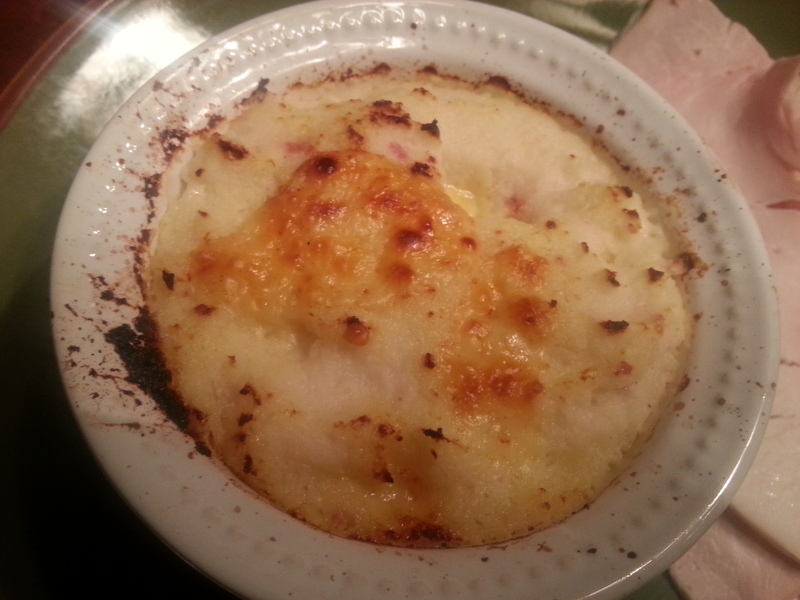 Recipe submitted by SparkPeople user CYNDIDAVISUSA. Below are the cauliflower and pie recipe information. 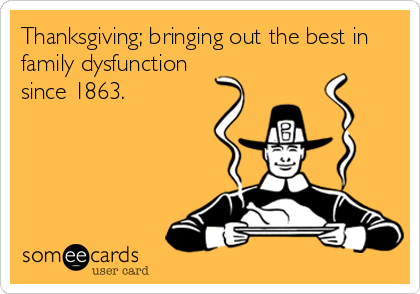 Please consider carefully before you subject yourself, your family or your guests to an unnecessarily high-calorie, high-carb Thanksgiving dinner. Try the substitutions that I mentioned. Plan ahead and happy holidays! Processor, adding the butter spray and the half and half to taste. Season with salt and pepper. Recipes for Pies: (Pumpkin, Chocolate, Key-Lime, Pecan)–also good for diabetics. Thanksgiving: Time to be with friends and family, not time to pig out! It is Thanksgiving time. 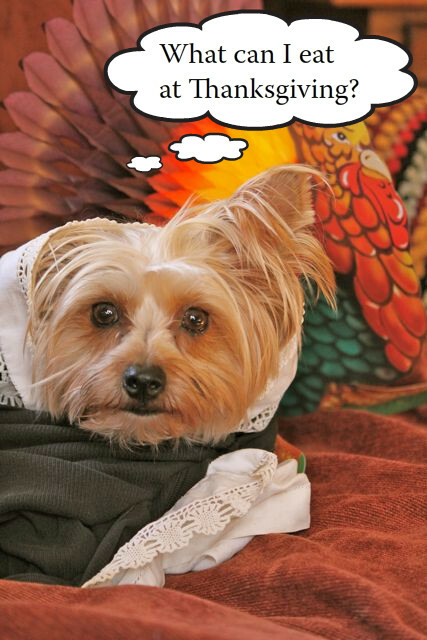 I will devote the next few blog reports on how to deal with Thanksgiving and your diet! You are going to be surrounded by holiday candy, pumpkin bread, pies, etc. I meet a lot of people who give up on their diet at the holidays or don’t even start with the excuse that they will start after the holidays are over. You need to take control of your life. You cannot have this excuse again. You have had it for years and it is the reason you are heavy or gain the weight back. Something has to change. How you view food has to change. So, it is the holidays. 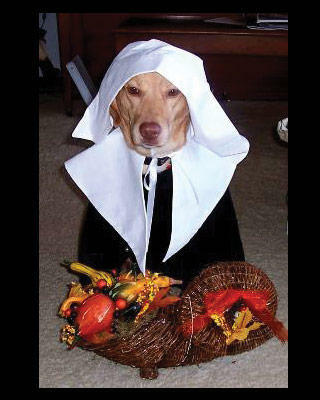 You think that the Thanksgiving pilgrims thought that you should gorge yourself with carbs at the holidays for them? NO. The message behind these holidays is about being grateful and celebrating a special day. It has nothing to do with sugary carbs. Thanksgiving was about sitting down and “breaking bread”, so to speak, with the American Indians, in the spirit of cooperation. The first Thanksgiving feast would have looked very strange to our modern eyes, consisting mainly of corn and meat. The spirit of the celebration would be easy for us to understand, because then, as now, Thanksgiving is a reminder of the bounty of the Earth and the importance of hard work and cooperation. You might be surprised to know how different the first Thanksgiving dinner was from what we enjoy today. They might have had cheese made from goat’s milk. The pilgrims and the Indians had some type of fowl and venison. The pilgrims often hunted fowl for a special feast follwing the harvest. Wild turkeys are native to New England, as are pheasants. Both were enjoyed by the pilgrims and Native-Americans alike and were included in the feast. The Native-Americans brought venison; some of the braves went hunting and brought back five deer to share. Other meats that may have been on the table include lobster, seal and swans. The food was placed on the table, and people helped themselves to it. Thanksgiving today includes many vegetables available, but in the 17th century, vegetables were not always plentiful. 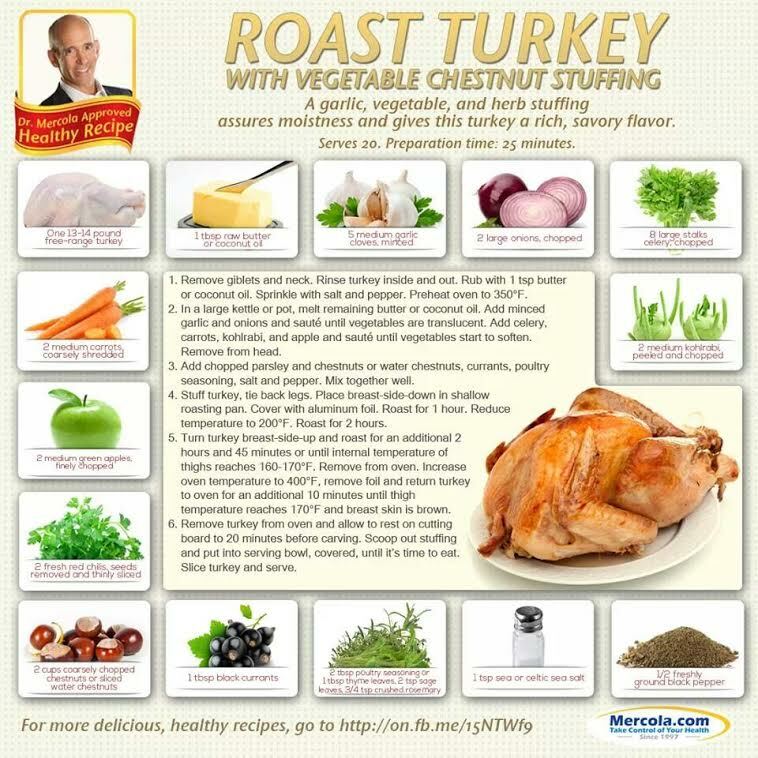 Special meals, even the Thanksgiving meal, centered around many different kinds of meat. 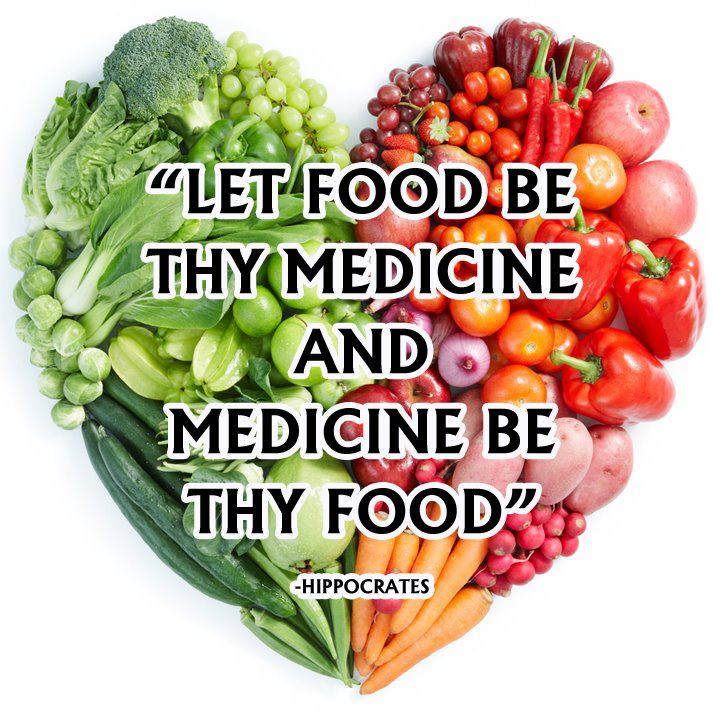 Common fruits and vegetables included pumpkin, peas, beans, radishes, carrots, onions, lettuce, plums and grapes. Walnuts, chestnuts and acorns were also plentiful. Though there was no pumpkin pie, the Pilgrims did make stewed pumpkin. They had cranberries, but no sugar, so they did not make cranberry sauce. Sweet potatoes were not common, so those were probably not on the Thanksgiving table. No pies or other sweets. They did not have an oven to bake pies, and even though they brought sugar over on the Mayflower, it had all been used by the time of the first celebration. The Pilgrims had little in the way of grain, they only had wheat flour. So, try to eat more like a Pilgrim than a Piggy for the holidays! 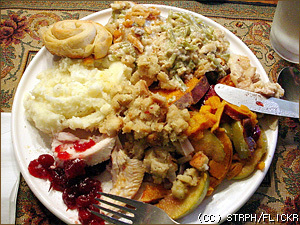 Tomorrow’s blog will show the carb chart on so-called “Thanksgiving” food. You must choose wisely.